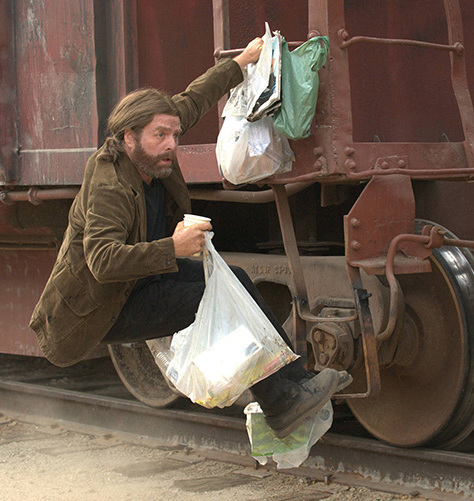 The second season of the delightfully deadpan “Baskets” (FX, 10 p.m.) begins with Zach Galifianakis’ Chip jumping trains like a hobo and throwing in with a traveling homeless circus troupe where he can at least put his Parisian training to use. Back in Bakersfield, his mother (Louie Anderson) hardly notices he’s missing though Martha is a bit worried. The extremely fanciful world of “The Good Place” (NBC, 8 p.m.) ends its first season in a one hour episode with Kristen Bell’s Eleanor pleading her case and trying to up her score and voluntarily going to the Medium Place. Adam Scott guest stars. The eve of a new administration is marked by “Through the Fire: The Presidency of Barack Obama” (BET, 7 p.m.) narrated by Jesse Williams; and “America’s New First Family: The Trumps Go to Washington” on “20/20” (ABC, 10 p.m.), reported by Elizabeth Vargas and David Muir. Chris Pratt guest stars on his wife’s sitcom “Mom” (CBS, 9 p.m.) as a riding instructor. Chefs on “Hell’s Kitchen” (Fox, 8 p.m.) cook in order to get a trip to Las Vegas. In the competitive dinner party of “My Kitchen Rules” (Fox, 9 p.m.) it’s Naomi Judd and her husband against “Real Housewife” Grandi Glanville and Dean Sheremet, whose ex-wife Lee Ann Rimes ran off with Glanville’s husband. Silicon Valley sends an offer for Rayna on “Nashville” (CMT, 9 p.m.). Leonard and Penny fight on “The Big Bang Theory” (CBS, 8 p.m.). A Silicon Valley Jay Leno and Craig Ferguson try on “Ballroom Blitz” and “Take a Chance on Me” on a new “Lip Sync Battle” (Spike, 10 p.m.). The month-long Thursday night showcase of Jane Wyman on Turner Classic Movies continues with “Here Comes the Groom” (8 p.m.), “Magic Town” (10 p.m.), “Larceny, Inc.” (midnight), “Three Guys Named Mike” (1:45 a.m.), “The Doughgirls” (3:30 a.m.) and “Make Your Own Bed” (5:30 a.m.). Men’s college hoops include Maryland at Iowa (ESPN, 7 p.m.), Davidson at Lasalle (CBS Sports, 7 p.m.), Connecticut at SMU (ESPN2, 7 p.m.), Richmond at Dayton (ESPNU, 7 p.m.), Memphis at Houston (CBS Sports, 9 p.m.), Clemson at Louisville (ESPN, 9 p.m.), California at Oregon (ESPN2, 9 p.m.), North Carolina Asheville at Winthrop (ESPNU, 9 p.m.), Gonzaga at Santa Clara (ESPNU, 11 p.m.) and Arizona State at UCLA (Fox Sports 1, 11 p.m.). NBA action includes Washington at New York (TNT, 8 p.m.) and Minnesota at Clippers (TNT, 10:30 p.m.). Third round play begins in the Australian Open (ESPN2, 11 p.m.). Kelly Ripa: Matthew McConaughey, James McAvoy, Christian Slater. The View: Cokie Roberts, Jim Gaffigan. The Talk: Thomas Lennon, Curtis Stone. Harry Connick: Kirstie Alley, Nia Long. Ellen DeGeneres: Tony Goldwyn. Wendy Williams: Meagan Good, Judy Joo. The Real: Jason George, Angie Martinez. Stephen Colbert: Johnny Galecki, Chris Matthews, Bash & Pop. Jimmy Kimmel: Priyana Chopra, Maren Morris. Jimmy Fallon: Aziz Ansar, Carrie Brownstein, Panic! at the Disco. Seth Meyers: Jim Parsons, Ben McKenzie, Jon Favreau, Dan Pfeiffer, Leah Shapiro. James Corden: Chris Hardwick, Nina Dobrev, Fitz and the Tantrums. Carson Daly: Wagner Moura, DIIV, Cameron Esposito (rerun). Trevor Noah: Scott Conroy, James McAvoy. Conan O’Brien: Andrew Dice Clay, Jen Kirkman, Billy Wayne Davis. This entry was posted in What's On TV, Winter Press Tour 2017. Bookmark the permalink. Both comments and trackbacks are currently closed.